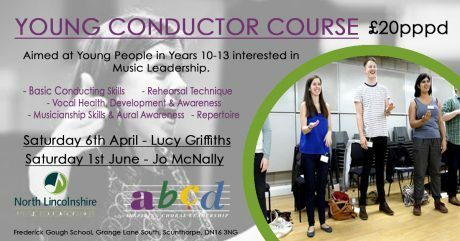 In partnership with North Lincolnshire Music Hub, abcd is offering two separate days of conductor training for young musicians between the ages of 14 and 18. This is a fantastic opportunity for young musicians to learn about basic conducting skills and have the opportunity to practice these skills on the podium in a stimulating day of active participation, observation and ideas. N.B. Please note this is a one-day course, which is being repeated. This abcd/North Lincolnshire Music Hub Education course also takes place June 1st.